GPSLog Labs now has a powerful and customizable filtering feature to clean up errors in your logs caused by bad GPS signals. The following graph comes from a log recorded while running and shows the kind of noisy data that is often present. The incorrect speeds mess up the maximum speed, average speed and distance stats and often correspond to a bad trace on the map too. The first filters you can choose from will discard invalid points from your log and then interpolate the speed and course between the remaining points. 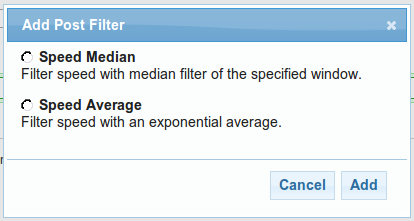 The second filtering stage applies an average function to the newly cleaned up data. Smoothing the speed graph will give you a more reliable average and maximum speed statistic and also improve the distance and time split data, but won't clean up the trace on the map or affect the total distance. The original speeds are shown on the graph below as a light blue line, and after applying a median filter, the thick blue line has been smoothed (no discard filters were applied for this graph). The new filters will only take affect for new uploads, existing logs will retain the data from the old filter that GPSLog Labs used to apply until they are reprocessed. Also, the discarded points from the old filter will no longer be shown on the Speed vs Time graph on the log detail other graphs tab. 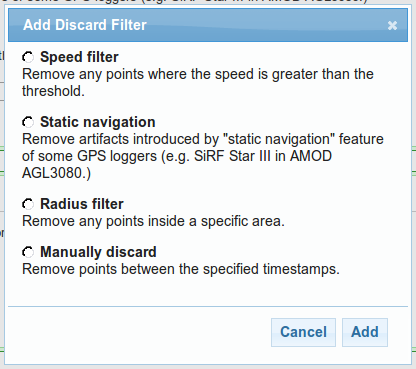 This information is only available now for logs using the new filter system from the Filters menu item. I suggest using a simple Speed Median filter initially, as that will clean out a lot of noise, setting the window time parameter to a larger value will smooth the speed more. I'll be describing the other filters in future posts. As always, let me know if you have any difficulties or suggestions, and I hope this new feature helps you get more out of the site and your GPS logger!